Race Report: After a day of fighting the block headwind, it was the diminutive man from the Isle of Man who came out of Marcel Kittel’s slipstream and powered his way around the big German to take his 4th stage victory in this year’s Tour. The Etixx-Quickstep rider wasn’t best pleased but the sprint was judged to be fair and Cavendish will now hope to stay on with the race and win in Paris. After several days of turmoil this tour was ready for some ‘quiet time’ as the riders began the trek northwards before their date with destiny in the Alps. With three cat 4 climbs it was always intended to be a day for the sprinters to resume their battle… and some such as Greipel (Lotto-Soudal) and Kristoff (Katusha) are yet to score. Marcel Kittel was not pleased with Mark Cavendish in the final meters. With a strong headwind predicted for the day ahead, the organization send the riders away 15 minutes earlier than scheduled but the bunch was in no mood to get racing. Spread across the road the speed was ‘steady’ and the only action was when Thomas De Gendt (Lotto-Soudal) jumped ahead to take the single point over the first climb. After 30km of riding Jérémy Roy (FDJ) made the move and he was quickly joined by three others: Alex Howes (Cannondale-Drapac), Martin Elmiger (IAM Cycling) and Cesare Benedetti (Bora-Argon 18). 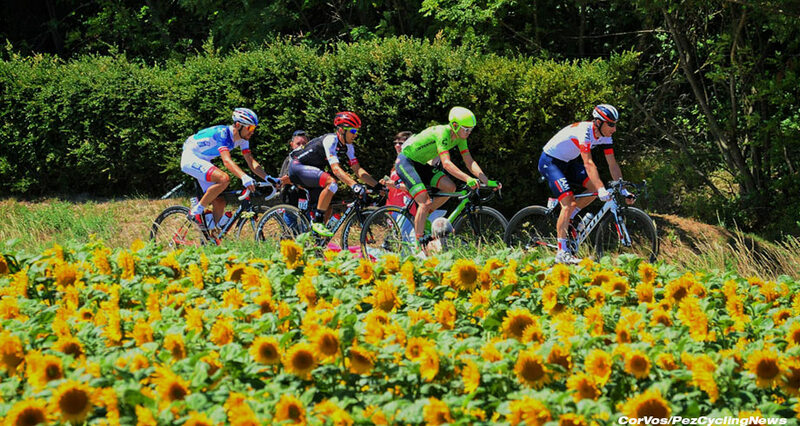 The peloton was content at this stage to let them go and they soon forged their way to a 4-minute advantage. With no threat to Chris Froome’s (Team Sky) yellow jersey it was up to the sprint teams to control the break but to begin with it was only Etixx-Quickstep who showed any interest. With the gap extended to 4:30 the others began to get involved, Dimension Data and Lotto-Soudal joining in. André Greipel had yet to get his name on the win sheet but with today being his 34th birthday he was sure to be extra motivated. This was the way it stayed with the sprint teams holding the gap at around 3:30 and the only real moments of note were Alex Howes topping out the Côte du Four-à-Chaux and then Cesare Benedetti taking the Côte du Four-à-Chaux a short time later. At the feedzone we had an abandonment with Mathias Frank (IAM Cycling) dropping out with, ironically, gastroenteritis. That left 186 riders still competing in this year’s event. 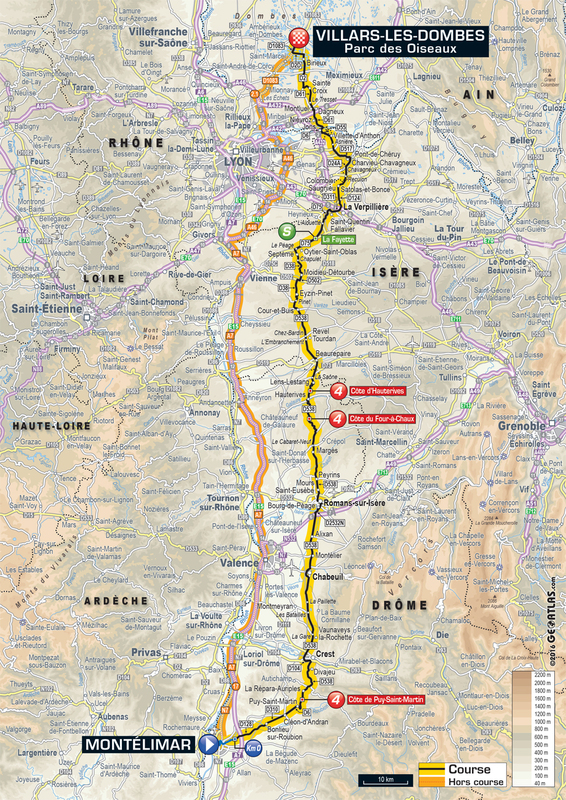 With the race now heading for the sprint point at La Fayette the leaders’ advantage was beginning to be reduced as the stage went very much to plan. Alexander Kristoff had mentioned at the start that they had a plan for today as, on paper, with a headwind finish it would suit the big Norwegian down to the ground. Meanwhile, Mark Cavendish’s DS, former pro’ Roger Hammond, was playing up the Manxman’s chances of taking yet another stage victory for Dimension Data. With the break approaching the sprint point after 145.5km it was Benedetti who took a bit of a flier to win the points with Howes following him over. Two minutes back there was a more interesting fight as Kittel, Cavendish and Sagan (Tinkoff) looked for points, Greipel content not to contest it. In the end it was a half-hearted challenge from Cavendish and Kittel, and Sagan easily crossed over first as he looks towards wearing green in Paris. And now it was simply the run towards the finish at Villars-les-Dombes Parc des Oiseaux with more domestiques coming to the front of the bunch and the gap coming down at the predicted rate. All of the talk in the pressroom was about the last 3km of the stage where the riders would turn through a 90˚ bend to the right and then fight a 60-70kph crosswind, and the carnage that was sure to cause. The GC teams would be up there making sure their men were protected from any incident that might not be covered by the 3km rule. And the sprinters would be giving it everything. The big question was how they would play it. 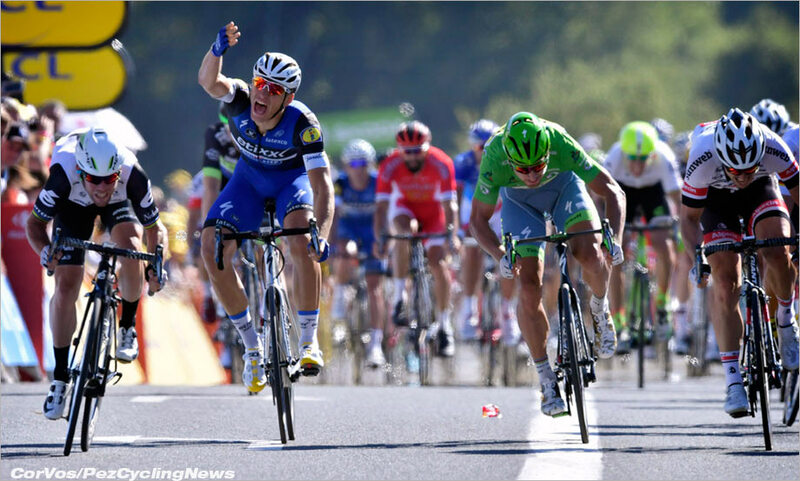 Would Kittel be virtually invisible until the last 300m? Would Cavendish pop out at the last minute or would Lotto-Soudal play their cards too early yet again and be wasted by the time the race reached the finale? 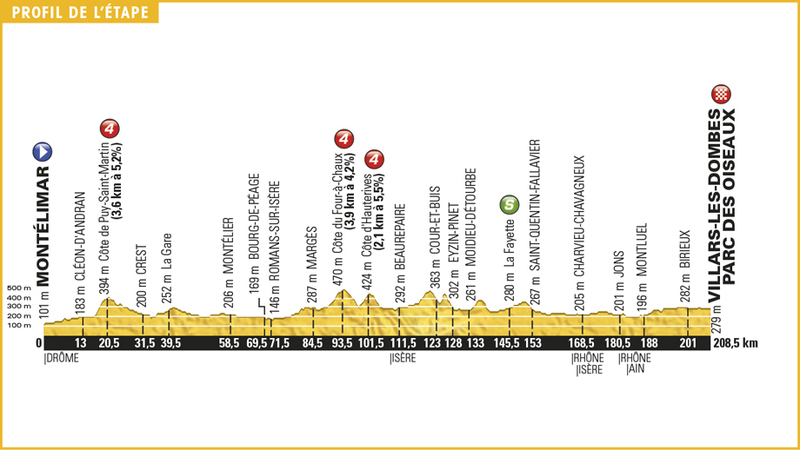 Then again, maybe one of the younger riders like Direct Énergie’s Bryan Coquard might take their chance. With the pace warming up nicely, unfortunately Cannondale-Drapac’s Matti Breschel crashed heavily and was the second rider of the day to abandon, this time into the ambulance although his injuries were not reported to be too serious. With concern of the finish straight crosswinds, the pace in the peloton had ramped up and the gap began to tumble. At just over 20km to run the lead four were just hanging 20 seconds off the front of the peloton as Dimension Data placed more riders into the chase. With only 20km to run, the peloton decided it was too soon to make the catch and the lead quartet was allowed to move back out to 40 seconds. They gave it everything hoping beyond hope that they might survive but the sprint catch was only a matter of time. On a little rise Howes began to lose contact as the man to initially kick things off, Jérémy Roy, was pushing hard to the finish. Before long the man from Denver was back in the pack as Dimension Data and BMC pulled the peloton along. And then there were two. Martin Elmiger wound it up at the front and Benedetti couldn’t hold the wheel and was quickly distanced as he headed back to the bunch. Roy was still looking good, easily matching the Swiss rider’s pace but with only 30 seconds over the bunch at 7.5km to go it was still looking like a sprint fest to come. It was all looking a bit messy at the front of the bunch as Sky and Katusha fought to keep their men safe, for different reasons. Lotto-Soudal now began to surge forward, having left their move later than on previous stages. At 3.5km to run the two leaders shook hands and accepted it would be the sprinters’ day. The bunch rounded the righthander into the crosswind and it was Cofidis that initially hit the front before Etixx put their men into the front spots. Switching across the road, Etixx was leading it out until Lotto hit the front at 1km to run. They were storming forward but Etixx passed them again and as the riders sped to the finish it was Kittel leading Cavendish leading Greipel… but the others were coming. 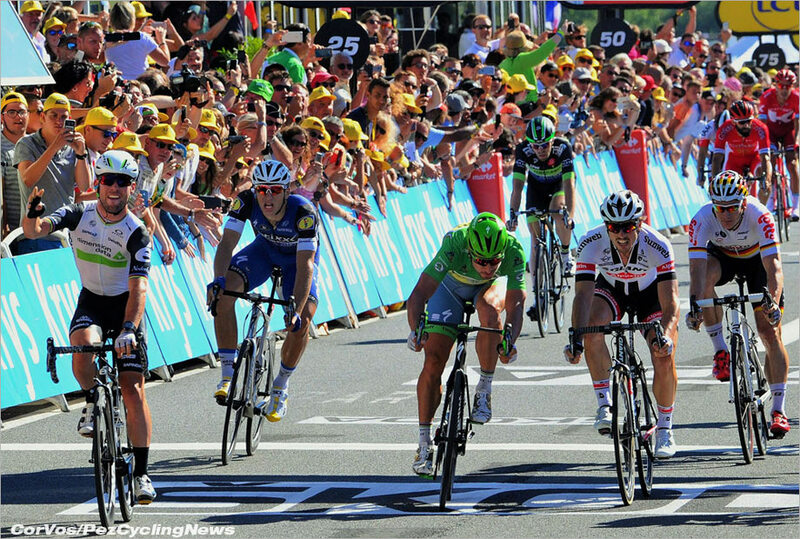 Cav’ made his move and came around Kittel as Kristoff, Sagan and Degenkolb (Giant-Alpecin) lined out across the road. Kittel, having made his move too early, threw his hands in the air complaining that Cavendish had switched across his front wheel but it was too late. The Manxman flashed across the line just ahead of Kristoff with Sagan placing third and Degenkolb taking fourth. 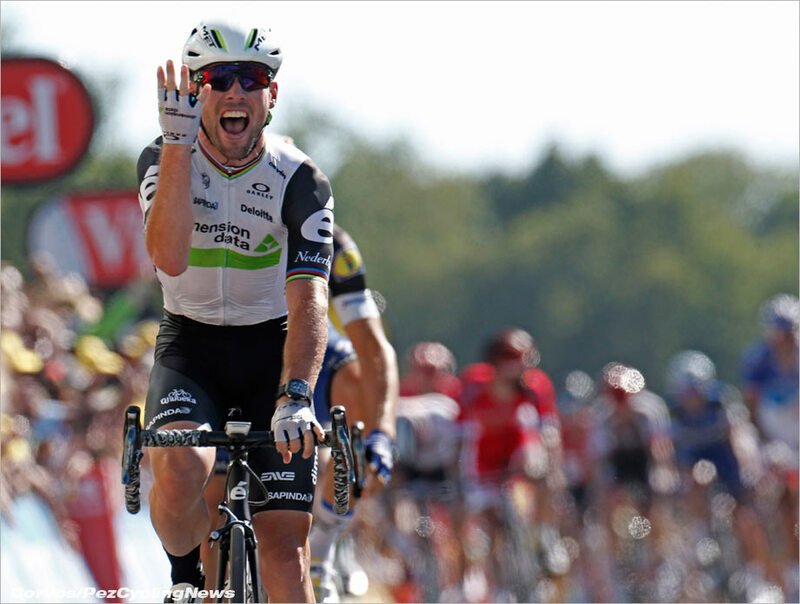 Mark Cavendish made it 4 wins into a strong headwind today. Kittel was complaining to anyone who would listen but the sprint, from the air, looked fair and Cavendish was celebrating his fourth stage win of this tour, as predicted by Robbie McEwan earlier in the day. The judges were examining the footage but it looked as if Kittel actually moved left and his cries of foul play were more ones of frustration than anything else. André Greipel was left once again without a win finishing sixth behind Kittel and wondering what he’s going to have to do to beat the others. With only two more sprint stages to go, everyone is wondering if Cavendish will stay to Paris or pull out before the Alps in order to be fresh for Rio. Having won on the Champs Elysee already, and in sensational form, you can bet he’ll be heading to the capital. 10 Fabio Aru (Ita) Astana Pro Team 00:05:16.